This entry was posted in Flyer and tagged Food Basics on February 21, 2013 by booradley. 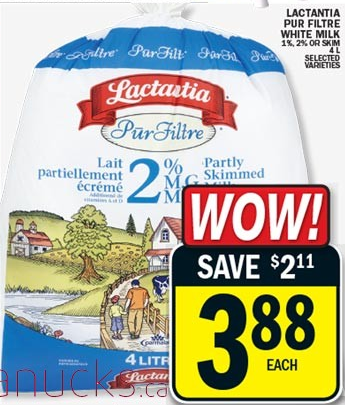 Food Basics Canada is offering Lactantia Pur Filtre Milk 1%, 2% or skim4L selected varieties for $3.88 (Save $2.11). This offer is valid until Thursday, February 21, 2013 only. This entry was posted in Flyer, Uncategorized and tagged Food Basics on February 18, 2013 by booradley. This entry was posted in Flyer and tagged Food Basics on February 14, 2013 by booradley. This entry was posted in Flyer and tagged Food asics on February 13, 2013 by booradley. This entry was posted in Flyer and tagged Food Basics on February 8, 2013 by booradley. This entry was posted in Flyer on February 7, 2013 by booradley.